Set in a secular pine forest in front of the natural reserve of Isola Bella, the La Plage Resort, one of the best luxury hotels in Taormina, is ready to enroll you in a different lifestyle, made of peace, nature and sea. With careful attention to detail our hotel provides a relaxing though contemporary atmosphere through minimalist furnishing and charming environments in every room and public space. Ideal for both the vacationers who are looking for nature's peacefulness or those who desire physical activities, emotions and new encounters, the La Plage Resort is undoubtfully one of the best luxury hotels Taormina and the whole Sicily can offer and its peaceful surroundings will ensure a perfect atmosphere for discussions, activities or relaxation. 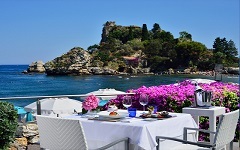 Surrounded by wonderful forest and with a breathtaking view over Isola Bella, the La Plage Resort, one of the best luxury hotels in Taormina, can also become the perfect romantic backdrop for the wedding of your dreams. Welcome cocktails on the panoramic terraces, fine food, an accurate selection of flowers and our attention to detail will ensure the big day will go perfectly smooth.